Because every sign location and installation is unique, Love Signs employs only the highest quality crew members to manage each sign service and installation with precision and attention to detail. Our crew members are routinely trained in the newest technologies and equipment and abreast of ever-changing codes and safety requirements. We use only the best materials in our installation and service work which includes high quality wire and insulators, non-corrosive fasteners, high strength welding materials and U.L. listed electrical components. 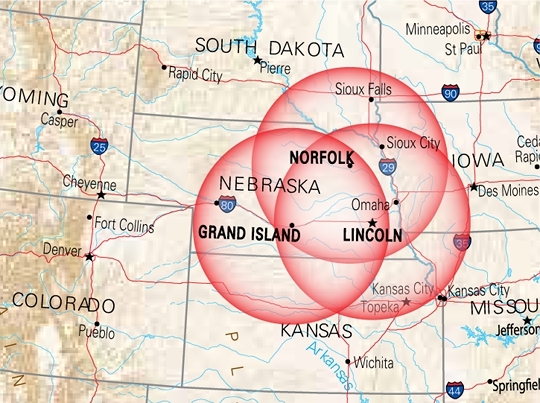 And with nine crane trucks at our disposal, we have the ability to service the entire state of Nebraska and outer regions. Love Signs is equipped to handle virtually all aspects of sign installation and servicing. Love Signs has been outstanding to work with. From the moment that we accepted the bid, to the day they were finished with installation we knew we made the right choice choosing Love Signs. Our electronic message center is very versatile and cost effective. It has increased our sales and we would recommend the purchase of one to other businesses. It is such a visible medium, many clients and non-clients comment everytime we change the message - so we know it is being watched closely. Our electronic message center has become an important layer to our overall marketing plan. I do want you to know how impressed I've been from beginning to end of this project! Your company is top-notch! The new digital marquee looks awesome! From the very beginning, you have communicated with us in the development phase, the flexible payment plan, the installation of the sign, and the training have been outstanding. Clock Tower Court’s goal is to be the Premier Retail Location in Columbus and we feel that our signage is a big part of presenting that image. Thanks to Love Signs we are achieving that goal. Columbus Public Schools had the pleasure to working with Love Signs on the digital displays and scoreboards for our new high school. The entire staff worked very hard to make sure our install was painless which was an absolute joy. Their staff always kept us informed of timelines and made sure we had everything we needed to operate as well as providing follow-ups once installed. Since this new install we have also used Love Signs for a donor wall that looks amazing. I will not hesitate to use them again. Thanks, Love Signs, for making our vision come through!